The high-profile musician, noted for his daring innovations, has decided not to perform during the Season – which is seen as the most important set of events for the Carnatic tradition. The old joke was that Chennai had three seasons: hot, hotter and hottest. But if this crack was told to a music or dance lover, they’d inevitably reply, “Don’t forget the December Season!” – a reference to the highest point of the city’s cultural life, which features a glorious month of Carnatic music and Bharatanatyam dance events. The Season often coincides with the Tamil month of Margazhi, considered holy for the Iyengar community of devout Shri Vaishnava Brahmins across Tamil Nadu. Through the Season, everyone seems to spend all their time hopping between venues, some which pride themselves on their century-old history, others which have started overnight. Over the decades, the Season has become like the IPL. 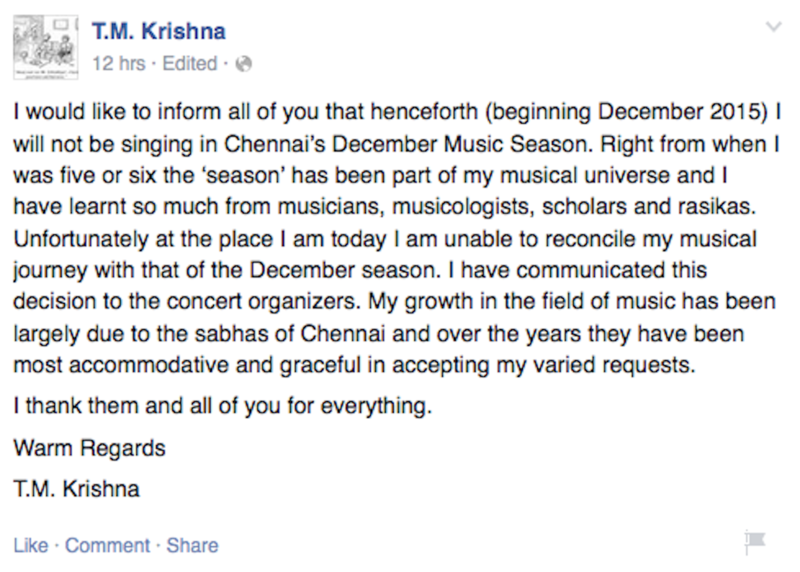 Carnatic music enthusiasts from across the world plan their holiday calendars to reach Chennai by December. For young performers, being featured during the Season is a sign that they’ve crossed a threshold. So it isn’t difficult to understand why a Facebook announcement on Wednesday evening by Carnatic vocalist TM Krishna sent ripples across the music world. For someone who in his own words “grew up in the corridors of the December music season”, this decision raised eyebrows, just like many of his recent concerts have done. After all, TMK, as he is fondly known by his fans and friends, is believed to be the biggest face of Carnatic music since MS Subbulakshmi and Mandolin Srinivas. His box-office appeal makes most of his colleagues envious. He enjoys this privilege for two important reasons. One, which his fans say, is because of his mellifluous voice that soars over three-and-a-half octaves. The other, trotted out by his critics, is his position of being a celebrity member of the Iyengar community. Both of these are true. TMK made his debut in 1988 in the Madras Music Academy, the most prestigious of all the city’s venues, when he was 12. Since then it has been a steady rise to success. About a decade ago, TMK’s music began showing a different shade. As a creative and restless thinker, he began questioning the format in which Carnatic concerts were presented and experimenting with it. The traditional format, designed in the 1920s by vocalist Ariyakudi Ramanuja Iyengar, was aimed at presenting a wide variety of Carnatic genres in a single performance. TMK’s experiments unsettled a performance form wedded to tradition but surprisingly caused his popularity to swell. In fact, some people began to attend his concerts to see what new innovation he would throw at them. Traditionalists, on the other hand, would depart from the venue consoling themselves that they would always listen to older recordings of his that they thought contained more brilliant renditions of a piece he had performed that evening. Over the last few December seasons, TMK has made news for several reasons. The biggest one in recent times was a hefty book he authored, A Southern Music: The Karnatik Story. The book, which had to be reprinted within months of being launched, revealed a lot of his thoughts about the Carnatic music scene, some valid and others that sounded like tantrums. He been outspoken about what he believes is the dirt within the Carnatic world, especially the challenges for those who aren’t Brahmin community. During the last Season, he performed in a movie titled One, featuring him singing across some of the most exotic landscapes one can find in South India. The official theatrical trailer was enough to have packed the halls with excited audiences. He has also created a buzz off stage. His projects include Svanubhava, which takes arts education to schools. It has received a great response, making TMK a hero to a whole new generation of audiences-in-the-making. For connoisseurs, his columns in The Hindu must be read word-to-word. They are analysed and debated on websites and online discussion forums devoted to Carnatic music, much like Tamil Nadu politics. Like any controversial figure, TMK isn’t without his detractors. He is often described as “eccentric genius”, but his critics say that he assumes his role for easy publicity. To many, this doesn’t seem to make sense, since is he is already popular enough. There is a joke frequently told in Carnatic circles: “What is common between DMK and TMK?” The answer: “Both seem passionate to rebel without a solid cause.” It may sound like a defence of tradition, but it serves to emphasise the unique position that TMK holds. It is against his backdrop that his announcement to refrain from performing at this year’s Season must be understood. While some have replied with heartfelt goodbyes, others have accused him of being arrogant. The fact is, for anyone remotely connected to the Carnatic world, TMK cannot be ignored. He is an integral part of the scene. 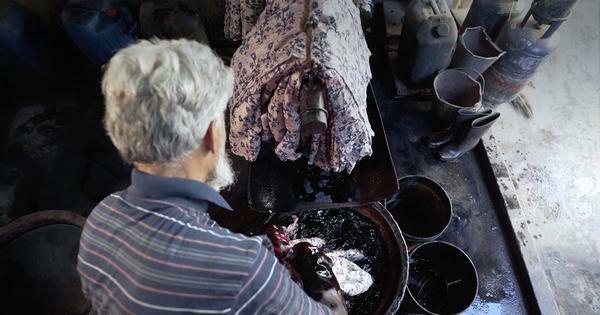 In the end, TMK’s decision may actually invigorate the tradition that he seeks to challenge. After all, he will have made space for other up and coming artistes. Veejay Sai is a writer, editor and a culture critic.